The Black Watch kilt is arguably one of the most famous kilts in the world. And one reason for this, is that the tartan used in this kilt is generic, meaning that anyone can wear this tartan without running the risk of offending the traditionalists. These traditionalists would have us believe that you must have a family connection in order to wear a clan tartan. This is something that I strongly disagree with, and believe that people have the right to wear any tartan that they wish. However the tartan from this particular kilt does not belong to a clan. Rather it belongs to the most famous of all of the Scottish Regiments, namely the Black Watch. Below you can see some photos of the black watch kilt being worn. 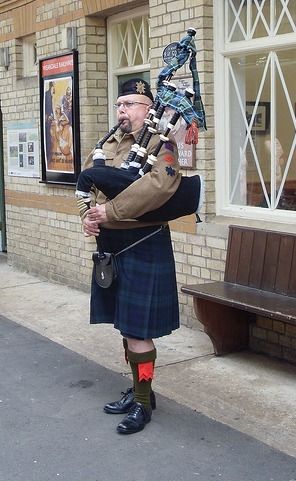 The first one shows a piper welcoming passengers at a Scottish railway station. 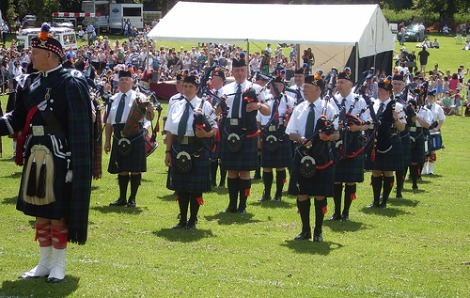 The next one shows the Bedford Pipe band, as they are preparing to play. 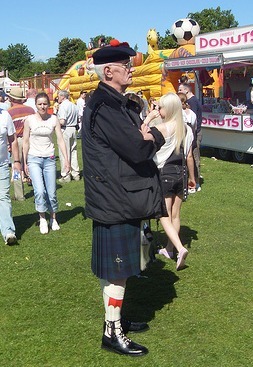 And the final one shows a distinguished looking Gentleman attending the Bathgate Highland Games. And for lovers of this particular kilt and tartan, I have some good news. I was sent an e-mail from the Scottish Register of Tartans, which is the new official register, set up by the Scottish Parliament. 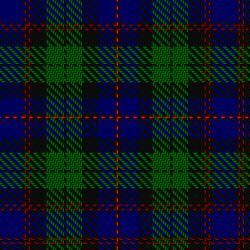 They have informed me that a new tartan was registered with them on the 5th of January 2010. It has been designed by The House of Edgar, as a tribute to the men and women of the Black Watch, both past and present. The name of this new tartan is The Red Hackle, you can see a photo of it below. The design of the Red Hackle tartan is based on the world famous Black Watch tartan, to which a series of over checks in two shades of red have been added. This is particularly appropriate as the Red Hackle is another famous symbol of the Black Watch Regiment, worn in their bonnets, it was originally used to identify troops in the midst of battle. It is uncertain whether it was first adopted by the Regiment during the American War of Independence, or later during the battle of Geldermeisen, on January 5th 1795. It is also appropriate that the new tartan was registered on the 5th of January, as this is the official regimental day, now known as Red Hackle Day. A proportion of all sales of the new tartan will be donated to The Black Watch Heritage Appeal. So if you are a fan of the Black Watch tartan, you may wish to add the new Red Hackle tartan kilt to your collection. If you wish any further information regarding this page, then drop me a line using the Contact Us page, and I will gladly answer any questions you may have.